It’s time for another round to Stack Your Cash at Swagbucks! Now obviously, you can’t stack your cash unless you have a lot of it and you can’t have a lot of cash unless you’re a savvy shopper. If you’re here, you’re undoubtedly a savvy shopper so don’t miss out on this deal. Get a 500 SB Swag Up Rebate on your next online purchase through Swagbucks! 2. 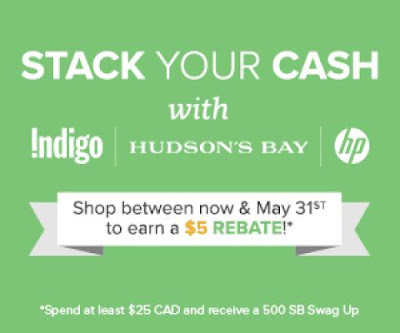 Spend at least $25 in the following stores: Indigo, Hudson’s Bay, or HP.ca using the Swagbucks Shop store links. 3. Your SB Swag Up Rebate will be available at 12am PT on July 5 and will expire at 11:59pm PT on August 8. Even better, both Indigo and Hudson’s Bay gift cards are available in the Swagbucks Rewards Store to redeem! And the cherry on top, BOTH now are on sale! So get shopping at your favorite stores so that you can shop some more for free!